I never really promoted security items, aside from pulling a few ‘plugs’ and yanking at a couple blankies, I just never introduced them to my kids. Pacifiers are great for ‘non-nutritive’ sucking for the first several months and help reduce the risk of SIDS in infants. Dolls or stuffed animals coincide with ‘animistic thinking’ where tots and preschoolers think that their inanimate objects have feelings…that ‘s why they like Thomas the Trains with their smiley faces and dolls that blink….ya like that fancy talk?…that’s about $8,000 in student loans talkin’. My kids did have the occasional hit of a pacifier, my daughter even used to steal them from younger infants. It might be bullying, but let’s call her ‘self-aware of her own powers’. Since I never had official attachment items, my children had no choice but to resort to me as their sole source of comfort. Why clutch onto a blanket at night when mom’s leg conforms to my body? I have pictures of my son clutching onto a piece of bread at a wedding reception. During dinner, on the dance floor, clutching onto grains all night. How astute was he to learn that carbs would be there for us in the most desperate of times. My second son tended to have a couple Thomas the Train cars in his hands often. My third son really likes snacks and doesn’t discriminate. My daughter? Well, we’ll get to her in a sec. Once I researched the ‘down’ sides of security items. I thought for sure I would find something about how they were a bunch of bologna and should be banned in America. It was the most frustrating 10 minutes of my time. All I could find was stuff that said it was ‘developmentally appropriate’. It was hard to admit that I was completely overreacting and possibly wrong. So….the daughter? She was starting out strong with only occasional paci swiping, but now at the age of 3, she is a full blown hoarder. I know her type….the little girls who are the ‘gatherers’ and the boys who are the ‘hunters’….it’s all historically ingrained. 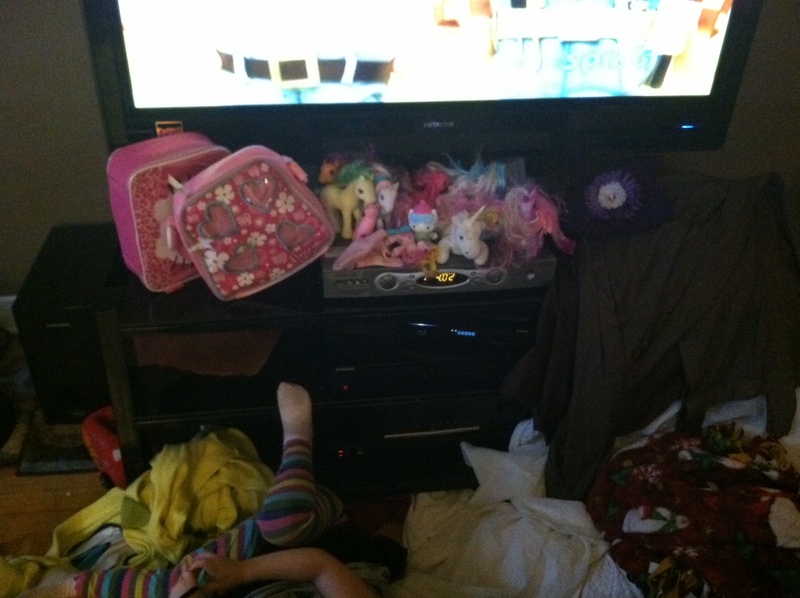 The little girls who take the Fisher Price Little People and will not admit defeat….not until every plastic figure fits into their arms. Blankets, pillow pets, dolls, lunch bags full of My Little Ponies, sure, but sometimes she carries around things that don’t even make sense. The other day with her usual cuddly crap she insisted carrying a rock, a rosary (far stranger if we were not Catholic), a popsicle craft stick. Her items are starting to be random. She freaks out if she drops something and usually won’t let you help her. What a good analogy of what we super women look like. We grapple at jobs, opportunities, family, sanity….we hold it all tight and don’t want help. Then we later look like little bag lady 3 year old girls crying in a batch of snow because it is all so heavy and we are tripping over it. 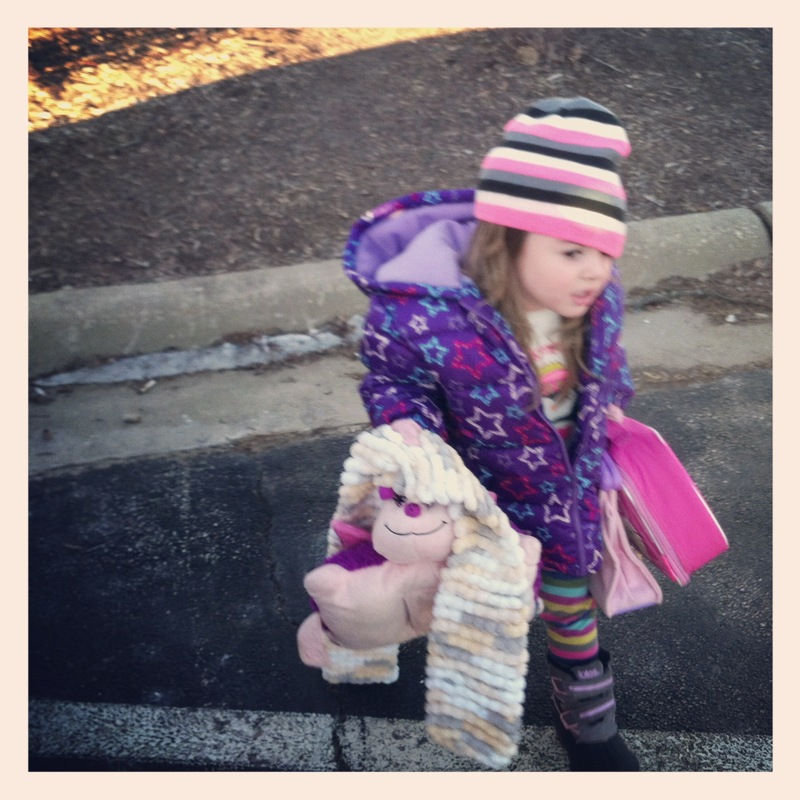 My husband says that she is like me…holding onto stuff. I don’t consider myself too attached to stuff because I usually leave the house without a purse…but then there is the ‘crap room’ (see ‘I’m a Tree Killer….and the Lorax is Pissed). I’m pretty sure my daughter’s stash carrying has something to do with the fact that I didn’t even attempt to breast feed her because…to rephrase my earlier thought….’If I’m having a fourth one…something has GOT to give!’ Who knows. Hopefully it is all a phase. I mean whoever heard of a girl liking ‘stuff’ turning into a woman….materialistic’? ‘shop-a-holic’? hoarder?….oh dear….It really can go either way….either she names each of her 100 or so handbags or she names each of her 100 or so potholders that have sentimental meaning and cat urine on them. You can’t take it all with you Maria….though she’s so headstrong…she’ll find a way to. We need to let her be maria and pray to God that her mate for life has the skill to build a very large closet for her.